The horse was part of the project “Horseplay”, presented by the Aiken Center for the Arts and the United Way of Aiken County in South Carolina. After picking up the fiberglass form in a truck borrowed from Bob Richard's Chevrolet, I had an interesting ride back to the studio. People along the road would wave, beep the horn, or just stare - they didn't know what to think about this guy with a huge white horse in the back of his truck. I named my horse “Seattle Blue” after Triple Crown winner Seattle Slew, who trained briefly in Aiken in the mid-1970s. 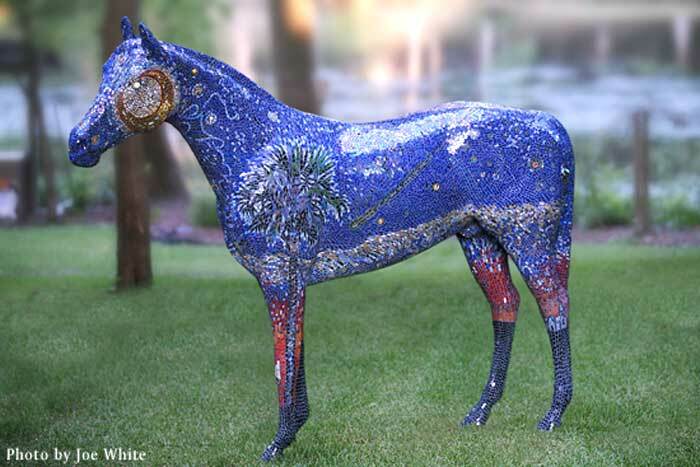 This Glass Mosaic Horse is a Van Gogh-inspired version of the South Carolina Flag. Each piece of glass has been painstakingly hand-nipped. The design uses more than 30 colors, including 5 iridescent blues, lots of mirror-backed glass with various other colors including: yellow, red, brown, terracotta, black, dark green, and purple. The design incorporates 2 versions of a Palmetto tree, 2 kinds of crescent moons, a church, and a shooting star. The horse also features a chrome retro bottle opener, adding function to this piece of sculpture. Designing and creating the horse was enormously time consuming. I spent approximately 360 hours selecting, cutting, and attaching pieces of glass to the horse. This was in addition to the 40 or so hours I spent sanding off the original primer, preparing the fiberglass surface of the horse for the glass. Long hours were also spent on the phone with manufacturer's reps and technical experts, in a search for adhesives that would withstand extreme outdoor weather conditions. Due of the nature of the iridescent glass used in the piece, this horse is the best viewed in low-light and is particularly beautiful at night. The iridescent glass reflects more color with less light. Depending on the time of day, the horse will look quite different. Changing weather (cloud cover) and changing seasons affect the quality of light, and should affect the way viewers respond to the horse. Despite appearing fragile, the horse is actually quite sturdy. The glass pieces are firmly attached with high-tech adhesives guaranteed to hold under extremes of heat and cold. I hope that Seattle Blue is placed in a public space, and that people have an opportunity to touch this horse, experience it at different times of day, see how it changes with the passing of seasons and years.